Our Photo booths are locally made and manufactured in Chicago with the highest quality components. The open air design allows us to take it anywhere (indoor, outdoor, big, or small venue). With the open air design, there is no limit to how many people you can fit in the shot. We have beautiful enclosed photo booths that pair perfectly with our open air Photobot system. The colors of the lights are adjustable to match the theme for any party. These enclosures will bring any event to the next level. At a backyard graduation party in Chicago. Premium Props with Premium Backdrop. Boat Party in Houston with an open air Photo Booth setup. Nautical Themed Wedding at The Lighthouse in Cedar Lake, Indiana outside of Chicago. Red carpet step and repeat vinyl backdrop in Houston. Enclosed LED Photo Boothat a baby shower in the Palmer House, Chicago. Custom Printed Backdrop for 30th Birthday Party. Props and Open Air Photo Boothwith our Gold Backdrop. Quinceanera open air photo booth with children signing the scrapbook. Setup in a restaurant with open air photo booth and gold backdrop. Gold Backdrop Open Air Photo Booth at a house party in Houston. Enclosed LED Photo booth at Palmer House, Chicago. In the Red Room with the Open Air Photo Booth. 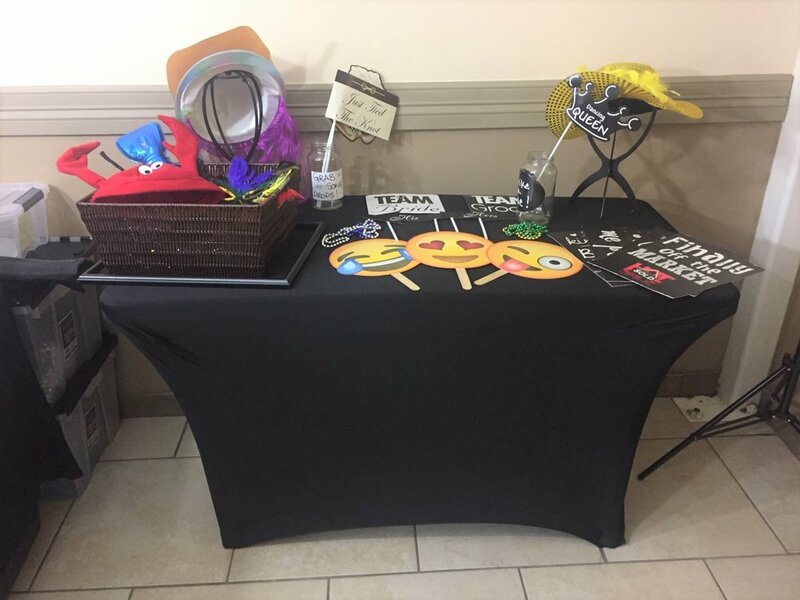 50th Birthday Bash Prop Table in Houston. Mad Props we has them! Props Setup at the Museum of Surgical Science in Chicago. Open Air Photo booth setup with one of our White bots. Setup in garage football party. Custom Printed Vinyl 10x8 step and repeat backdrop. One of our bots next to the props.